Sydney’s commercial market remains tight with vacancy rates low at 4.8%, rents high, and incentives decreasing further. The solid demand which triggered such conditions has resulted in strong effective rental growth over the year. The ongoing effects of limited B Grade stock were evident earlier in the year, with the rental gap between prime and secondary buildings only around 40% higher compared to the average of around 90%. This year rents in Sydney over were around double that of their equivalent grade in Melbourne. This highlights the competitive opportunities available in Melbourne compared to Sydney, despite conditions in Melbourne growing similar to those in Sydney. Landlords will continue to benefit from the inflated Sydney CBD market this year, as most new developments are scheduled for completion from late 2019 onwards. We will see around 70,000sqm of stock enter the market, whereas in 2019 approximately 180,000sqm will be completed. This influx will offer Sydney CBD tenants seeking Premium and A grade space stronger leasing deals and greater property options. However, tenants after secondary grade space will have to adjust to rising rents despite revenue increases not necessarily matching. Such conditions generally see company’s down-sizing or considering areas outside the CBD. The commercial market in Melbourne continues to strengthen, a result of the city seeing significant economic and population growth. This is seen in white collar employment growing by 3.2%. Melbourne had Australia’s largest population growth between 2006 and 2016, with the ABS stating that 92,038 migrants relocated to Victoria in 2016. These factors have contributed to a vacancy rate of 3.8% and net absorption of around 128,389sqm over the year. Although significantly more stock will come to market this year than last, the majority of the 92,400sqm is pre-committed. Many of these 2018 developments are located in Docklands, working to unify the area and increase its appeal. The ease in vacancy across Melbourne CBD will be more noticeable from 2019, with only around half of the 380,000sqm set for completion being pre-committed. It is also important to note the backfill of space resulting from these movements will provide market relief as tenants upgrade out into brand new buildings. Sub-leases are expected to become more popular options for tenants this year as they increase in volume. Rising rents and competition for space has resulted in businesses focusing on efficiency and as a result, reducing their space. Backfill space from such down-sizing is then ideal for sub-leasing. This offers smaller tenants who typically take secondary grade space an alternative in difficult markets. With NAB recently announcing 4,000 job cuts over the next three years – and experts predicting the other major banks to follow – increasing excess stock paves the way for subleases to further penetrate the market. 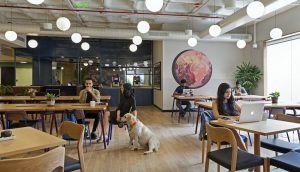 In other workplace trends, co-working spaces continue to rise in popularity. However, it is yet to be seen whether landlords will embrace them widely given the pressure they put on services, ageing buildings faster. Although they are attractive for many smaller tenants due to their flexibility, trendiness and perks such as free drinks, beyond microenterprises or start-ups with unpredictable growth they are generally more costly than leasing office space. The appeal of co-working spaces will likely fluctuate over the next couple of years as both landlords and users of co-working space assess the benefits versus costs of co-working spaces. For some, the financial burden as they grow could be the tipping point, taking priority over any flexibility and cultural benefits they provide. Flexible tenancies and shared spaces are also increasingly being incorporated by landlords. In order to better accommodate smaller tenants, some owners are giving tenants the ability to downsize by hiring meeting rooms and common spaces throughout the building as opposed to as part of their tenancy. This means tenancies only include a business’s core space and are more efficient. Whether these arrangements are financially beneficial for landlords or truly attractive to tenants will determine their longevity. Landlords are also looking to be innovative in technology regarding building security as technology advances and workers increasingly seek more flexible office hours. Methods such as facial recognition, fingerprint scanning and phone ID scanning are under generally those under consideration. Concerns that could arise here involve cyber-security, as these measures are much more susceptible to hacking than traditional security passes.